Although I'd never claim mastery, I have gotten to the point when using tools - such as power drills, circular saws, staplegun, etc. - that I no longer have to really think about how I'm supposed to use the tool. This development makes fixing or creating new things around the property much more fun (and faster, too!). 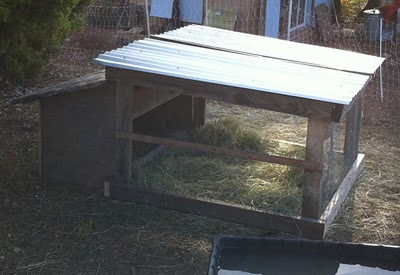 With this new ease, I was able to bang together a duck shelter out of all scrap materials in a single afternoon. The design idea came from "Storey's Guide to Raising Ducks" by Dave Holderread. Two challenges with the original design, however: it would be too hot in the summer, and as designed, the geese and dogs could get into it. The geese get territorial during egg-laying season, and I didn't want the ducks to get booted out of their shelter. And the dogs, well, they're a bunch of egg-stealers. Rotten dogs. Then there was a third consideration: the shelter would need to be moveable. Gooslandia's pond is being dug out this weekend, and we hope to move all the waterfowl to their much larger digs by next week! The shelter is three pieces: the roof, the main area, and the egg-laying box. The egg-laying box in the back is not attached, nor the metal roof. Both will be after the move. I've also put a piece of tarp across the wired front (which faces North, but not shown in the above photo) to act as a windbreak. I thought the crossbars on the two sides would be enough to keep out the dogs and geese. Nope. Both just "duck" under it :-). Will need to add some vertical bars at approximate 8-inch intervals to keep the interlopers out. The laying box will get a divider at some point. 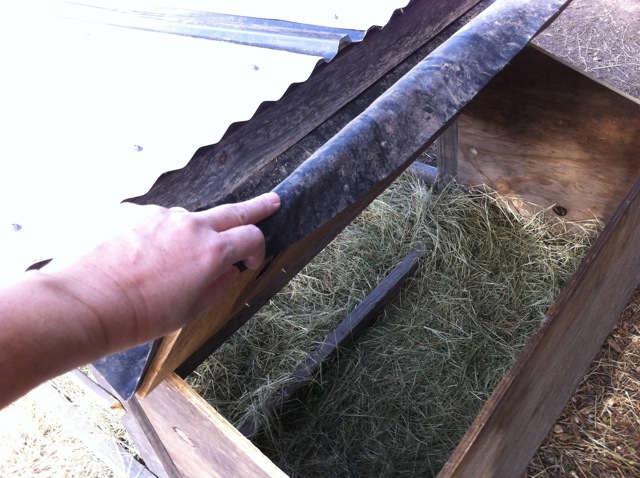 The laying box roof is covered with recycled pond liner to keep rain out. The metal roof may get a small gutter and downspout attached for rainwater collection at a later date. Oh, and that black stripe down the center of the roof? The metal corrugated roofing pieces I had weren't quite wide enough, so I used a piece of smokey clear corrugated roofing that was laying about to make up the difference. The only new thing purchased were the hinges for the laying box roof. I probably should have bought a few new boards - working with twisty lumber isn't much fun - but the ducks haven't complained about the design. In fact, it hasn't been very cold, so they've not used the shelter much at all! 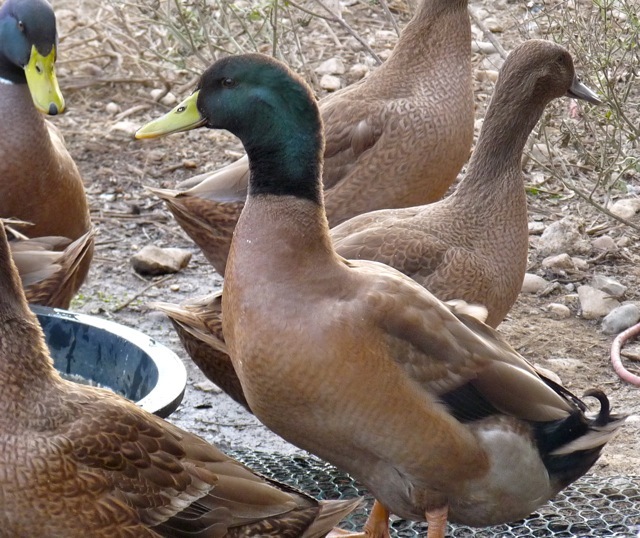 The Khaki Campbell males (drakes) have bright green bills, orange feet, and black-green feathered heads. I love the little curly feather on their hindquarters! First Goose Eggs of the Season!